Fun. Fuzzy. Females. Like us on Facebook at Guam Improv. 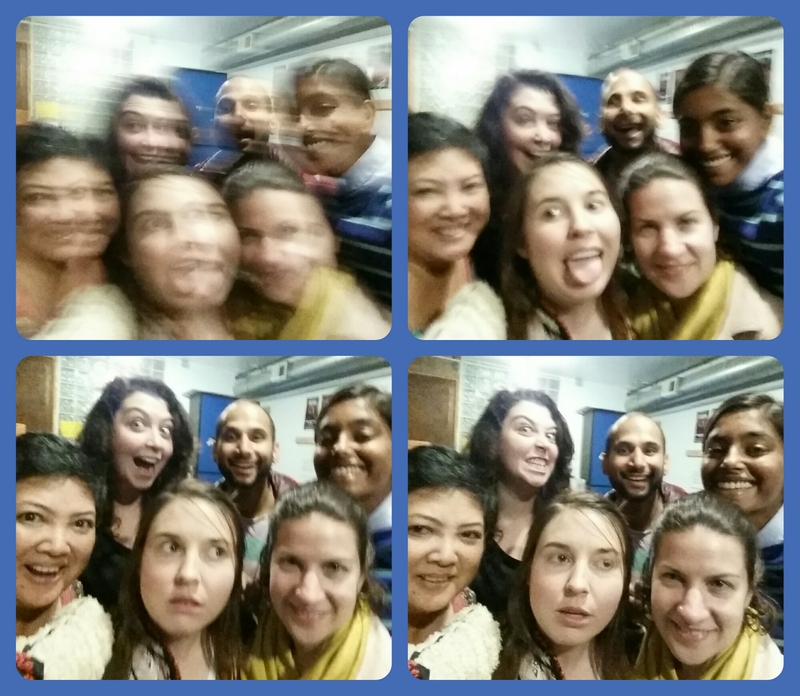 (and one fun, fuzzy guy – Nish Tewari, who coached us on Oct. 16) Clockwise: Nish, Mithra, Ariel, Ashley, Shirley, Frances. We’ll be with host Ron Chapman (on Twitter) at S.F. 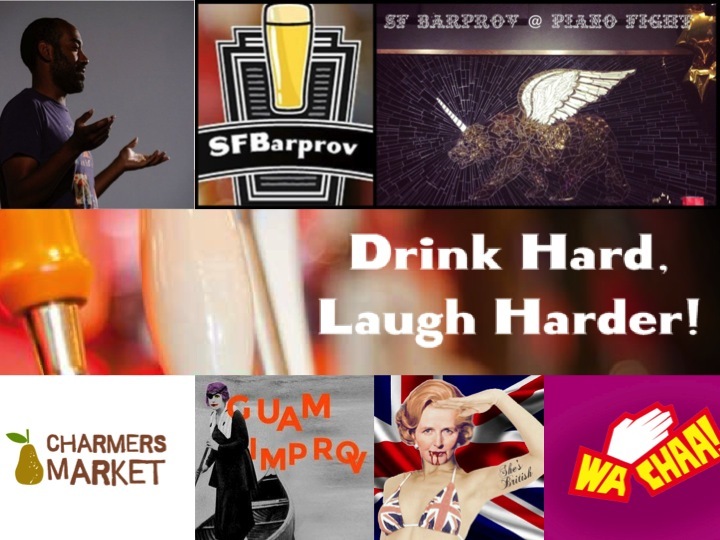 Barprov’s November 3 show, with Charmers Market, She’s British, and Wachaa!, on PianoFight’s Cabaret Stage. 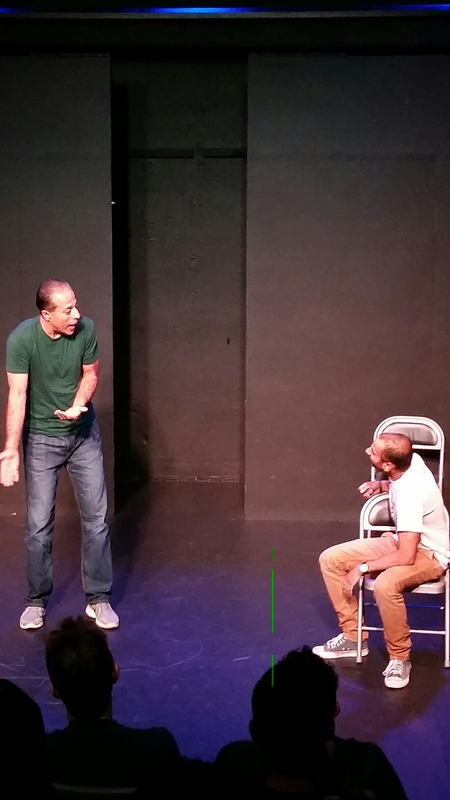 Four improv teams + Comedian + Free = a fun Tuesday night in San Francisco. In celebration, here is a picture of me and my buds from 10th grade I think. I was 15ish here. It’s a photo of a picture that was framed by my bud Sharmi and given to me as a birthday gift. AHHHH … the yesteryears of the wonder years! Photos can bring back such wonderful memories. BUT … You know what’s even better!? 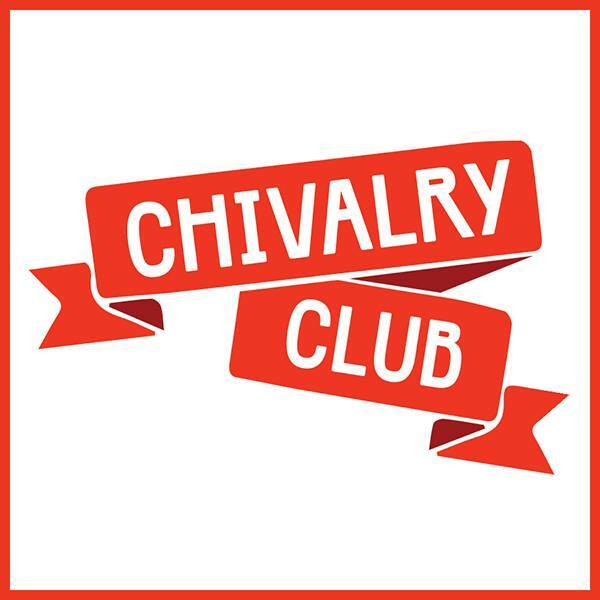 Every Thursday, 10:30 pm at San Francisco’s Stage Werx (on web, Facebook), Chivalry Club (on Facebook) – a long-form improv team – inspired by your photo and your story behind the photo hosts what they call #ThrowbackThursday. Every Thursday night at 10:30, Chivalry Club gets the scoop on a photo from your past and then turns it into a raucous, hullaballoo of improvised comedy. Every picture tells a story, so get your sweet patootie down here and share yours! We promise not to make fun of that ol’ bowl cut too much. Hey dawg, you comin’ to the show? We’ll randomly select one or two pics during the show. I hope we get yourrrrsss! Tomorrow, Oct 1, Guam (on Facebook) will open for Chivalry Club’s #ThrowbackThursday show. And meanwhile, Guam members will keep looking for some sweet photo memories to share. Also, Efficient Office Practices (of Facebook) will be sharing the evening with us. SO MUCH IMPROV! Tickets in advance at Eventbrite OVER HERE. Week 5 of THUNDERDOME Cage Match (on Facebook) was Tuesday. 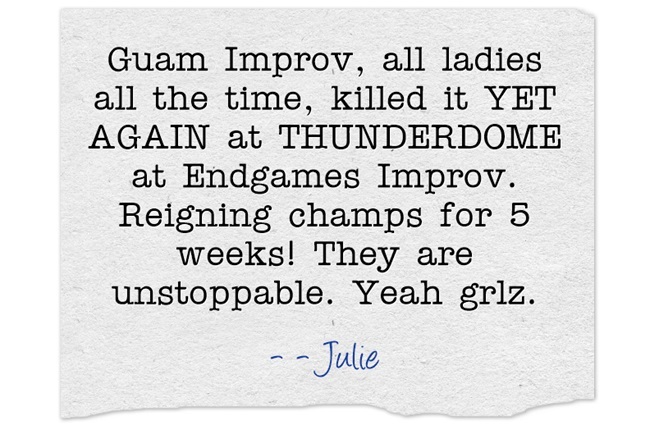 Guam (on Facebook), an improv troupe, had our fifth win (after our fourth week’s win)*.Thanks GUAMANIACS! As we head into week 6, we do not know and do not have a sixth sense who will be keeping Dermy, The Pig, warm after next Tuesday. We do know we’ll have fun! Thanks to the debonair duo of So Much So (on Facebook) for a great evening. We did not win the THUNDERDOME rock, paper, scissors, which determines who enters first or second. We entered first. Here we are in the green room after our set. As a benefit of performing first, Guam had the pleasure of watching So Much So do their thing – connecting through character relationships that are interesting, engaging, and entertaining! And if you were wondering – Who can make the relationship between a human being and a bovine engaging? MOO! So Much So can do so (much so). Human being + Bessie, So Much So (L-R: Ray, Nish) keeping it real and organic. Thanks to host/emcee Julie for a fun Sept 15 evening! “Two teams enter, ONLY ONE SURVIVES! 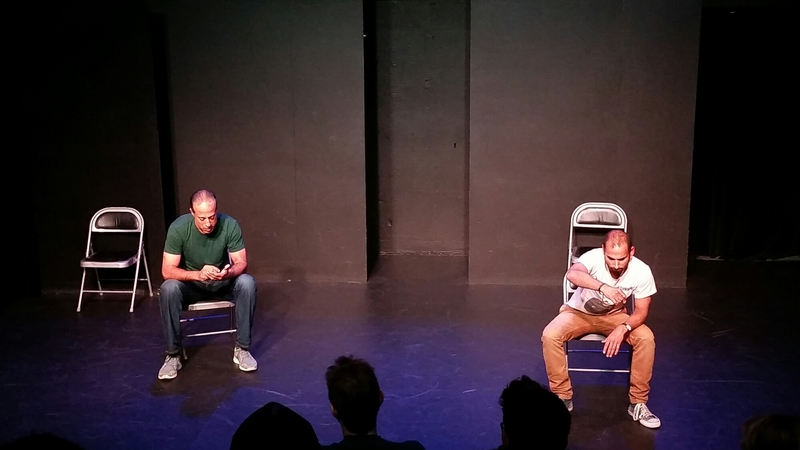 THUNDERDOME is the weekly cage match style show through Endgames Improv Theater. 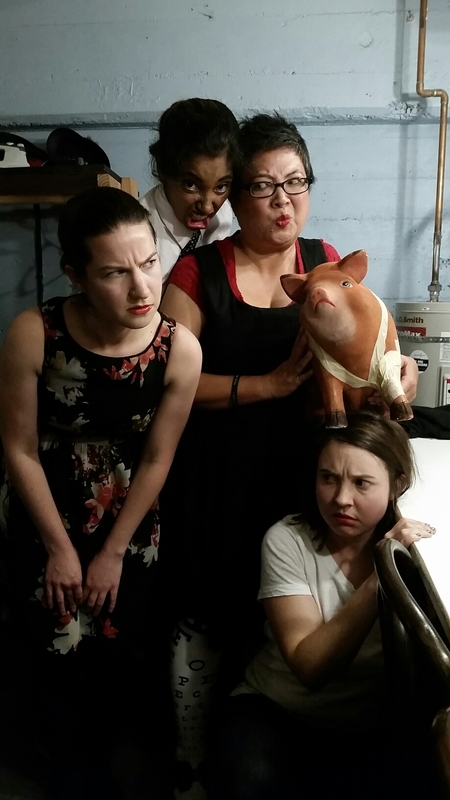 Every Tuesday at 9 pm two teams enter the THUNDERDOME and improvise for the audience’s laughter and adulation. 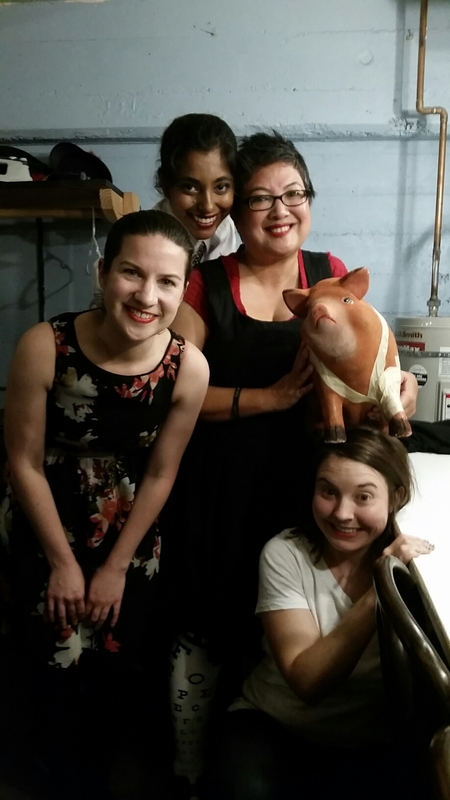 We will be taking care of Dermy, The Pig, until next Tuesday, September 22 – when we share the next THUNDERDOME with Challenger Michetti Cuts – the dashing duo of Sam Turnbull and Brandon Knapp. We do not know who will win. Our sixth sense has not been completely honed. We do know that five of us will be at THUNDERDOME, so yeah – we’ll have our full Guam crew. * Here we are after wins during weeks one, two, three, and four.